Since the launch of the 930 3.0 Turbo in 1974, the “Turbos” have been the most powerful 911s of any generation. 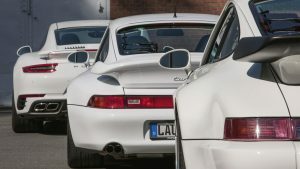 Porsche Classic pitted the two latest air-cooled turbo 911s – the 964 Turbo 3.6 and the 993 Turbo S – against the latest 991 Turbo 150 to compare three of the best sports cars of all time. The great thing about old cars is that they allow people alive today to transport themselves back to another era. All you have to do is open the door, hop in, shut the door and start the engine, and the clocks start furiously ticking back in time – by 20, 30, 40 or however many years. You can visualise the dashboard of Marty McFly’s DeLorean counting backwards before your eyes. Classic Porsche 911s are the best time machines in existence: Each generation of this ‘king of the sports cars’ shares a genetic connection, a common design and technology DNA, that has never been broken, creating a unique opportunity to travel back to days gone by in the 911. This car gives young people the chance to experience that well-known metallic clunk as the lever in the 911 door handle engages, immersing themselves in a world of products, technology, colours and designs created before they were even born. For older people, too, this is a fascinating opportunity to travel back to their youth – on the one hand to reminisce about the past, but also to look back with all of the knowledge and context of the present day, and see how fast the world around us – and particularly the car – is changing. Time travel is taken to a whole new level when the most technically advanced Porsche 911 of its day itself becomes a time machine – like the 964 Turbo 3.6, the 993 Turbo S and the 991 Turbo. If you step out of one generation of this car and into the next, you can see how the status of a super sports car and the limits of what is technically feasible are catapulted further ahead and into the future with each generation. In 2017, the 991 Turbo is the perfect example of this. Its list price in Germany starts at 176,930 euros. The two older models are among the most valuable – and most rapidly rising in value – 911 models in recent history. 993 Turbos in good condition cost at least as much as a new 991 Turbo. 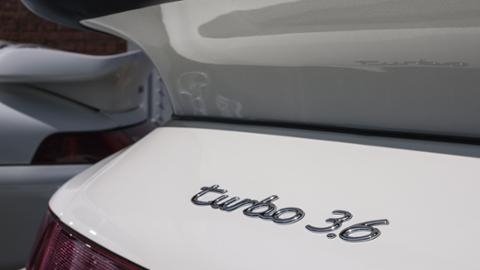 A Turbo S in perfect condition, with a mileage significantly lower than the 40,000-kilometre threshold and a unique Porsche-exclusive specification – like the Firn White model in this trio – easily surpasses a new, top-specification 991 Turbo in value. 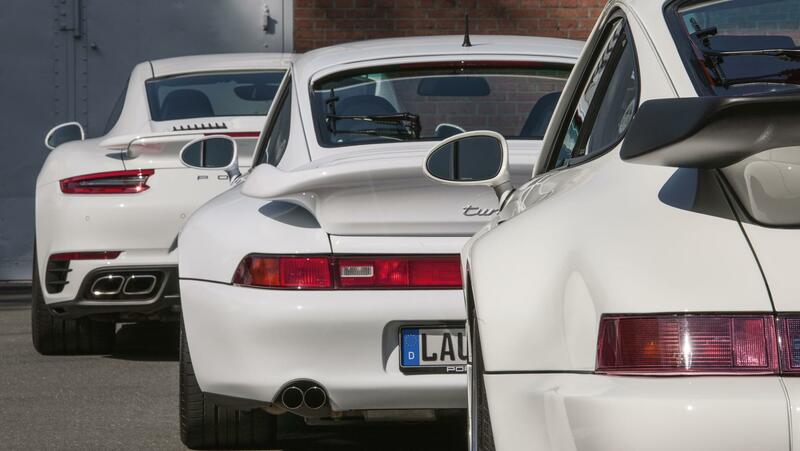 The same applies to the Grand Prix White 964 Turbo (on the right in the photo): another low-mileage car delivered from the factory with an exclusive Porsche finish. The fascination with these cars is about more than just their financial value – a lot more. But we cannot ignore the fact that both the 964 Turbo 3.6 (price in June 1994: 207,880 marks) and the 993 Turbo S (price in February 1998: 222,500 marks) are now worth virtually the same in euros as they were in marks when bought new, just two decades ago. But that’s not all: We have recently seen some exceptional models on sale for sums of 300,000 euros or more. The time machines used for this feature by PORSCHE CLASSIC are not for sale – but with their detailed and continuous service histories, exceptionally low mileages and exclusive specifications, they would likely fall into this latter price category if they ever were to be offered for sale. Click. The black door handle of the 964 emits its unmistakeable sound when operated. The door opens easily – a hallmark of this car, whose roots go back five decades. I climb in, and the interior still has that familiar new car smell, almost 23 years after its first registration on June 1, 1994. The ex-works car was originally ordered and registered by Porsche in Stuttgart. It’s a special 964, and not only because it is one of fewer than 1,500 Turbo 3.6 models ever produced. No – in this case, it is the car’s exceptional, harmonious aesthetic, the result of its custom specification and the perfect colour combination of a white exterior with a red leather interior. And that it actually looks like a new car, creating a perfect illusion of travelling back in time to the early 1990s. I find myself wondering who has treated this car with such immense care. Today, this Turbo – one of the last 911s with the classic “standing” headlights in the wing – is part of a sports car collection owned by a man who is truly passionate about Porsche. While the 964 remains in his ownership, it will not age. The history and specification of the Turbo is fully documented. The seemingly endless list of exclusive Porsche details makes for fascinating reading. Originally, according to the order, this 911 should have been fitted with seats in a cashmere-coloured leather. But that never happened; this selection was actually a placeholder used in the configuration process at the time. 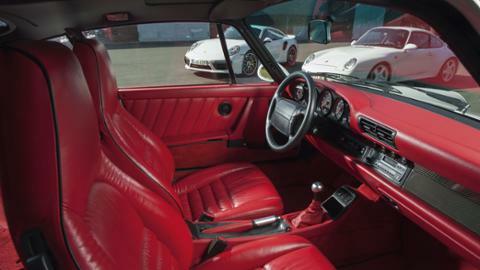 Instead, the 911 was fitted with an original, Porsche-exclusive full leather interior in the red “Can-Can” colour way, complete with matching red carpets, at the factory. Black piping completes the ruffled leather finish. The switch panel and centre console in black carbon create a sporty contrast with the red interior and white exterior. The gear shift and handbrake lever are clad in aluminium, carbon and red leather. Someone was daring enough to make these decisions when this car was ordered – thank goodness! Porsche presented the 964 Turbo 3.6 to the world in autumn 1992, at the Mondial del Automobile in Paris. Billed as the successor to the Porsche 964 Turbo 3.3, the 3.6 litre M64 engine was larger and more modern, increasing power to the rear axle by 40 hp compared to the previous 3.3 litre engine (M30). When the Turbo 3.6 was launched in 1993, its 360 hp was virtually unmatched by competitors. What’s more, the driver actually had the opportunity to put this power to use on the road – a key factor and a crucial differentiator between the few viable competitors at the time. And yet it was still like riding a cannon ball, although the series-standard differential lock was reassuring. When the turbo took effect at just under 3,000 rpm, torque went through the roof. From just 2,400 rpm, the torque was 450 Newton metres, rising to 520 Newton metres at its highest level. Even today, in an age in which virtually all compact cars boast a turbo engine, these are impressive numbers. Porsche indicated that the car could do zero to 100 km/h in 4.8 seconds. Let’s jump back in time. In 1991, I was working for a major automotive magazine as a young and upcoming editor. The 964 Turbo 3.3 was launched around that time. One summer evening that year, my immediate supervisor asked me if I could give his girlfriend a lift to Cologne. But I needed to be back in Hamburg the next morning for an editorial deadline. His girlfriend was nice, but she wasn’t MY girlfriend, and who wants to drive 850 kilometres in one night? But then the man – who was more of a friend than a manager – pointed to a red test car parked just outside. It was the new 964 Turbo 3.3. He smiled – and I smiled back. It was a fantastic night. Only twice in my life have I voluntarily chosen to cross the country in one night purely for the pleasure of the drive. The first time was in the 964 Turbo 3.3. The second time was in its successor, the 964 Turbo 3.6. That must have been in spring, perhaps 1994 or 1995. The car was parked up just like the 3.3 had been a few years before. This time, I drove from Cologne to Hamburg and back, because I had since moved to write for a different automotive magazine. It was another great night – one of those nights in which you’re happy to be alone. The radio – and I still remember this clearly because it really got under my skin and fitted perfectly with the cities on my route and with the car – was playing a song by Udo Lindenberg, a Porsche fanatic from Hamburg. For some reason, the band BAP also sang a Lindenberg hit that night, if I remember rightly. The radio switched from WDR2 in the west to NDR2 as I travelled north. The autobahn at night, the headlights, the glow of the radio and the five 911 instruments in the interior, the flat engine at the rear. Sometimes, fortune smiles down on you. Moments like this remain with you. I’ve never forgotten the magic of the 964 Turbo 3.6 that night. But that magic didn’t come from the car’s new top speed, which had increased from 270 to 280 km/h and pushed the speedometer up to almost 300 km/h. No-one can maintain this ‘trump card’ speed for long. But (and could the environmentally minded please look away now): 230 km/h was and remains a good cruising speed for this 911 Turbo. However, the real magic of this car stems from in its unique traction and flexibility, which had seen drastic improvement even since the 3.3. In fifth gear, the 3.6 reduced the time taken to accelerate from 80 to 120 km/h by 3.6 seconds, to just 7.1 seconds – a world of difference. The car always had more to give, no matter the gear. Even more breath-taking for me was this vehicle’s braking system. From a speed of 100 km/h, the Porsche Turbo 3.6 could be brought to a standstill in an unbelievably short 35.6 metres. The Turbo was the global champion in this discipline. Even at 200 km/h, it had a stopping distance of just over 130 metres. If you’ve ever had to replicate this situation on the road, you’ll have some idea of the forces involved. In most other cars of that era, coming to a complete stop from a speed of 200 km/h was enough to make you feel nauseous. But this is what separated the wheat from the chaff; this is when you recognise that the Turbo takes knowledge and expertise from racing and transfers it to the road; this is where the Porsche 964 Turbo 3.6 earned its legendary reputation. It was a technical masterpiece, but this 911 was anything but a toy. The rear-wheel drive demanded respect, particularly at even the slightest hint of wet weather. In these conditions, it was evident that there was still room to perfect the technical concept of the 911 Turbo. Personally, that night when I was driving between Cologne and Hamburg and it started to drizzle in the valleys while I negotiated the bends of the A1 in rural Bergisches Land, I would have appreciated a Turbo with all-wheel drive. My wish was to come true. The 993 Turbo, launched in March 1995 at the Geneva Autosalon, changed everything. Porsche had started to look towards the future: Harm Lagaaij, chief designer, and Horst Marchart, the member of the board with responsibility for development, had long been working on the dawn of a new era for Porsche, sparking the final evolution of the air-cooled, flat-engine sports car with the new Porsche 993 Turbo. Another clunk, or, more accurately, a click. The 993 Turbo S is opened with a brand-new, redesigned door handle in the same colour as the car. According to its paperwork, this 911 is a Turbo S; visually however, it has the more civilian appearance of a “standard” Turbo with enhanced performance. And that’s a good thing – this Porsche, registered on February 19, 1998, is clearly the more aesthetically pleasing of the two, as it is lacking the rear spoiler of the “official” Turbo S, which is somewhat of an acquired taste. However, this also means that the car is missing the lateral air intakes for the rear wheels, which later became an unmistakable hallmark on all 911 Turbos from the 996 Turbo onwards. Inside, this Turbo also features a sophisticated, exclusive finish. It was delivered to the USA with black leather seats, stitched in deep Guards Red. The speaker housings and CD storage compartment are also adorned with exclusive leather. But let’s focus on time travel: In the first few seconds after starting the twin turbo M64 of the 993 Turbo S (with an enhanced performance of 450 hp ex-works in the S model), you don’t experience the huge generational shift compared to the 964 that you may be expecting. But the difference is in the drive. Twin turbochargers and the all-wheel drive integrated into a 911 Turbo for the first time ever mean that the 993 is probably the most powerful air-cooled 911 of all time – regardless of whether the car is an S model or not. In fact, the 993 surpasses the 964 in performance (0–100 in 4.1 seconds, cracking the magic 300-km/h mark) and with its all-wheel drive. From a technical perspective, sitting in the 993 creates a sense of being fast-forwarded to the 21st century. However, in terms of aesthetics, the Porsche 993 Turbo design is firmly rooted in the 20th century. 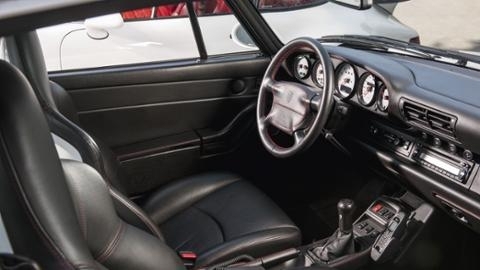 And that experience is typical of air-cooled 911s: Technical progress is evident in each and every new generation, but the design, and the feel of the interior, have been frozen in time across the decades. This is what makes the air-cooled Porsche 911 so fascinating. And the 991 Turbo? From the cockpit of the 993, the car is pure magic. The two generations and couple of facelifts you would expect to see before this leap simply did not happen; we travel from the late 90s straight through to the present. However, the DNA in the design and the drive provides a link to the past, and we have the designers and engineers at Porsche to thank for that. They put the soul into the 911 Turbo – in every generation and in every era.